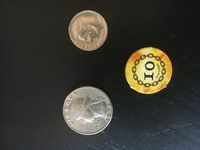 Is there no regular thread or geeklist for people who are asking the BGG community to help them identify a game piece? My son found this piece in our house I don't know what game it belongs to. I would think this would be a fairly common problem in the community, but I can't find a thread or geeklist corresponding to this. Anyways, here is the piece that I can't match to a game. Sorry about not rotating the photo first. Thanks in advannce for any help! I have a feeling that means "Trademark and copyright Warner Brothers Entertainment Interactive." Have you played any games based on movies lately, especially fantasy stuff like Harry Potter or Lord of the Rings? Wow! Great catch and yes, after a couple of tries I found a match to Clue: Harry Potter Edition. Thanks!